d you get into teaching? 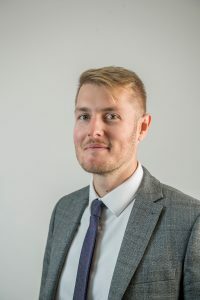 I studied Aeronautical Engineering at University of Salford, then after my degree I pursued a career in the IT sector running a sales department, so teaching wasn’t my first job. After a while, I decided to retrain and secured a place at Leeds Trinity University. At Uni, I worked on an ‘Aim Higher’ project to encourage more young people to consider studying in higher education and it gave me an interest in teaching. It’s that light bulb moment when students actually connect with something that is so rewarding. Why choose to teach maths at a UTC? I liked the idea of the technical aspects of teaching maths at a UTC, relating maths to engineering and all the links to industry. What did you do prior to UTC? I taught in West Yorkshire after training. In January 2017, I was appointed a Specialist Leader of Education (SLE) and did some work evaluating school improvement in maths in West Yorkshire schools. For three years, I ran a research project for the West Yorkshire Maths Hub around mathematical reasoning. I’ve worked with 18 schools over the last three years in developing their maths teaching skills. At my last school I ran our teacher training programme, so I’ve been involved with teacher training not just in maths but across all subjects. What have you noticed since arriving at the UTC? It’s a really positive culture. That’s partly because the students have chosen to come here, and they want to get on and learn. They’re constantly linking their maths to their specialism, so we get questions like, “How does this work in computing?”. They’re a bit more focused and driven. Plus it has to be said that the facilities here are amazing! What are your strengths as a maths team? We are a fully qualified maths department, by that I mean that everyone has been trained as a maths teacher. Plus everyone has a higher level qualification for maths, so we’re a highly skilled department. You may think that would be obvious, but it’s often not the case as schools struggle to recruit well qualified maths teachers. How does maths relate to the UTC specialisms? Quite closely. For example, at KS5 the computing and A-level maths are very well interlinked with lots of cross-over, so we’re making sure that the maths the students need for computing units are delivered in maths lessons beforehand. For students studying sports science, there’s a lot of core maths, and for students studying health sciences, there’s all the statistical elements. What are your ambitions for your department? We want people to come to the UTC not just for the specialisms but because of the quality of maths. Ultimately, we want to offer the full spread of maths courses available, including further maths, and we’re well on the way to that. We’re also entering students into more and more competitions including at national level, and we’re strengthening our academic links, talking to both universities in Sheffield about links with their maths departments.